RAA.2810 - (pricing) "AZURE SEAof ENDURANCE"
Beautiful 'Picasso' Ave beads in facetd jet are the perfect find for these hand made beads by Grace Ma. The art of glass bead making, hand pressed beads or of a technique called 'lamp work' is centuries old - and carries a very interesting history you may read about in our history section. But recently there has been a new birth of lamp work beads all over the United States. Any of the major Bead shows from Tucson to Milwaukee, from New York to Los Angeles will reveal how beads are formed from rods of glass cane in gifted hands to become miniature works of art over a hot flame. 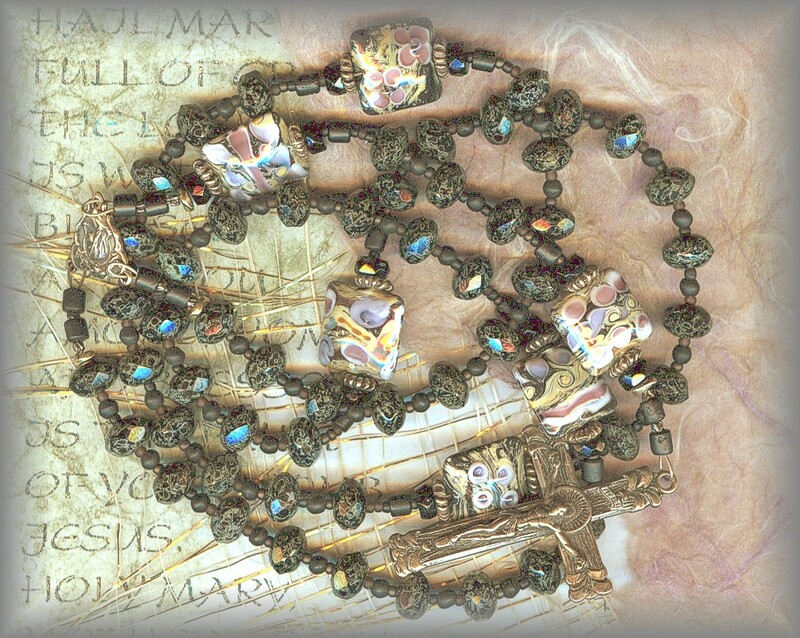 Below we have incorperated some of the work of these beadmakers into our rosaries, chaplets and religious jewelry. We hope you enjoy their beautiful wrk. Rosay designs are inspired by the seas of Israel but dedicate your ordary to a loved one or a special event. AVE BEADS: Faceted gemcut ccrystals with a hint of color appearintg to reflect the colors in the Paters,. Each compliment the work of American Artist, Grace Ma. 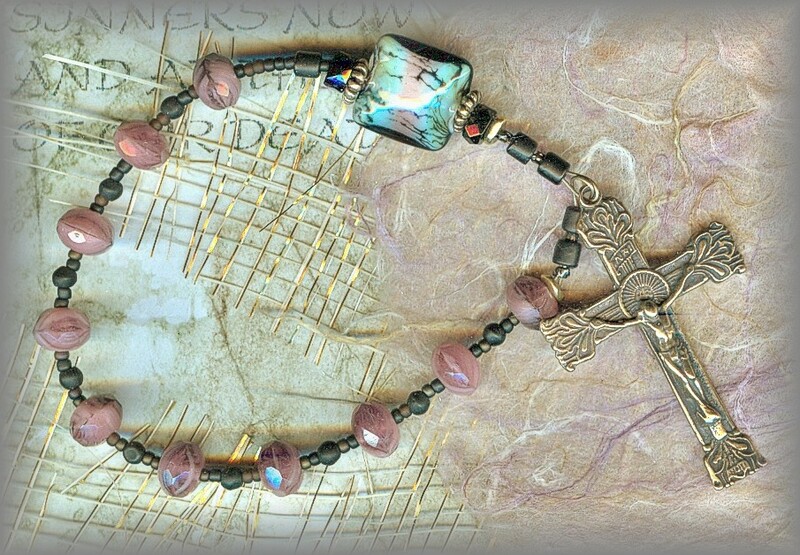 PATER BEADS: Handmade Pater beads are soft swirls of earth tones, clay, sand and lava caught in a stormy, glassy, crystal sea. Unable to show their beauty without holding it up and letting the light play through it and across its surface. 49 But when they saw him walking on the sea, they thought it was a ghost and cried out. 50 They had all seen him and were terrified. But at once he spoke with them, "Take courage, it is I, do not be afraid!" 51 He got into the boat with them and the wind died down. They were (completely) astounded. 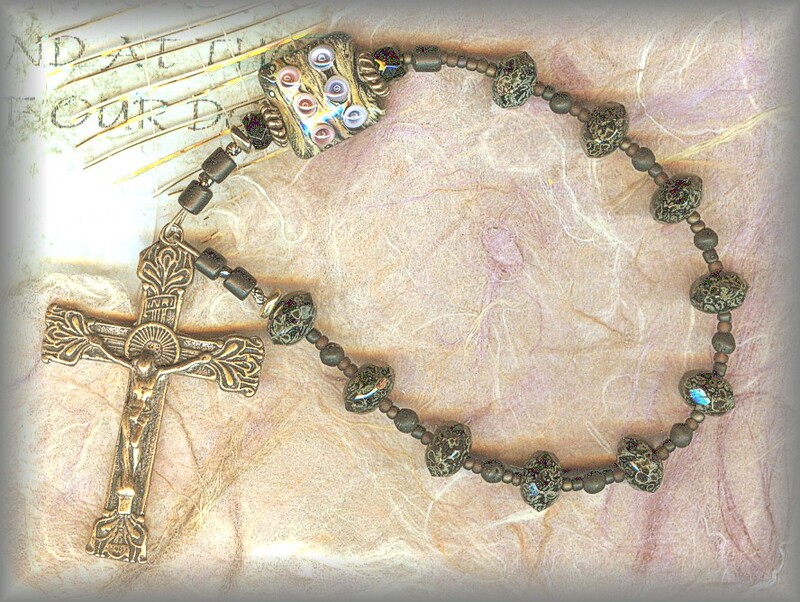 All crucifixes, centers and medals available individually in sterling silver and solid bronze. Each cast from antiques or vintage pieces. For more information go to the SUPPLIES link at the top of the page and to see whole collection. 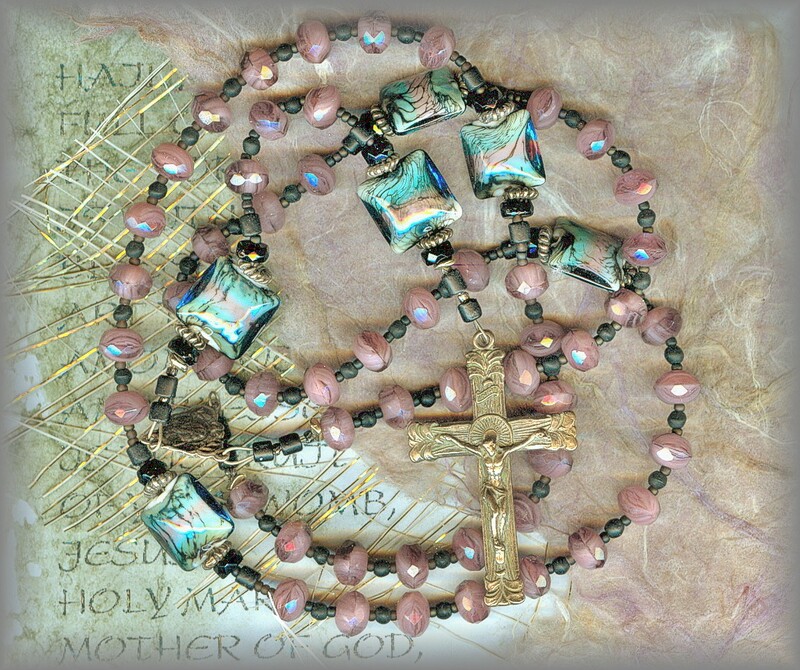 AVE BEADS: Ave beads are faceted 'Gem Cuts' in a light rose that pick up the colors in the Paters. PATER BEADS: Like mini works of art, each bead teases the imagination to see and azure sea interrupted by fishing nets tossed into the blue sky and capturing rose sunsets. 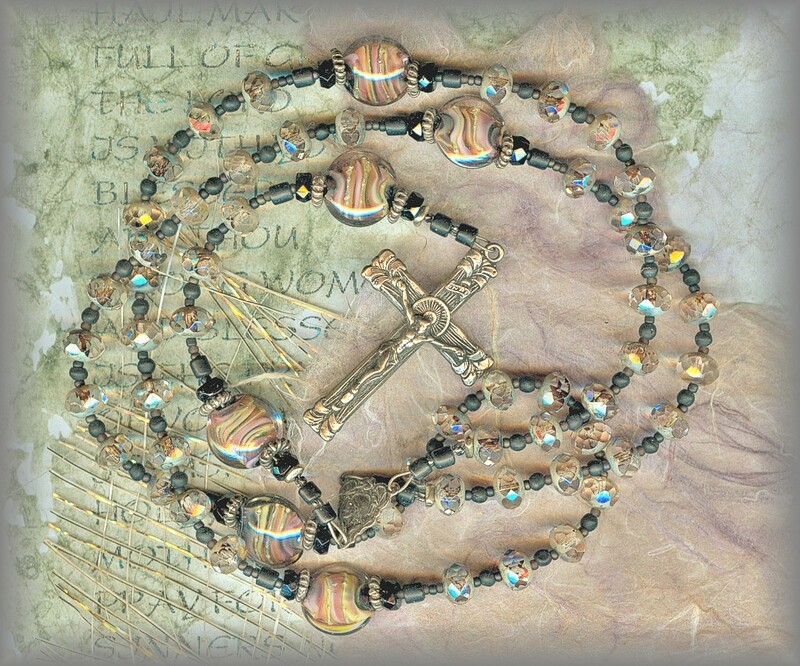 Each hand made bead is by Grace Ma, an American Bead artist. "Rabbi, when did you get here?" Jesus answered them and said, "Amen, amen, I say to you, you are looking for me not because you saw signs but because you ate the loaves and were filled. 27 Do not work for food that perishes but for the food that endures for eternal life, 15 which the Son of Man will give you. For on him the Father, God, has set his seal." 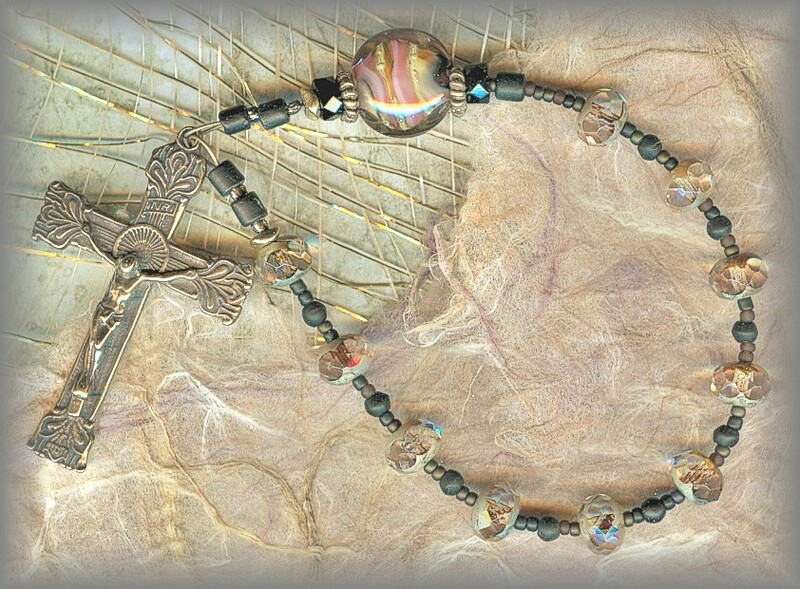 AVE BEADS: Ave beads are faceted jet black to compliment the Paters. 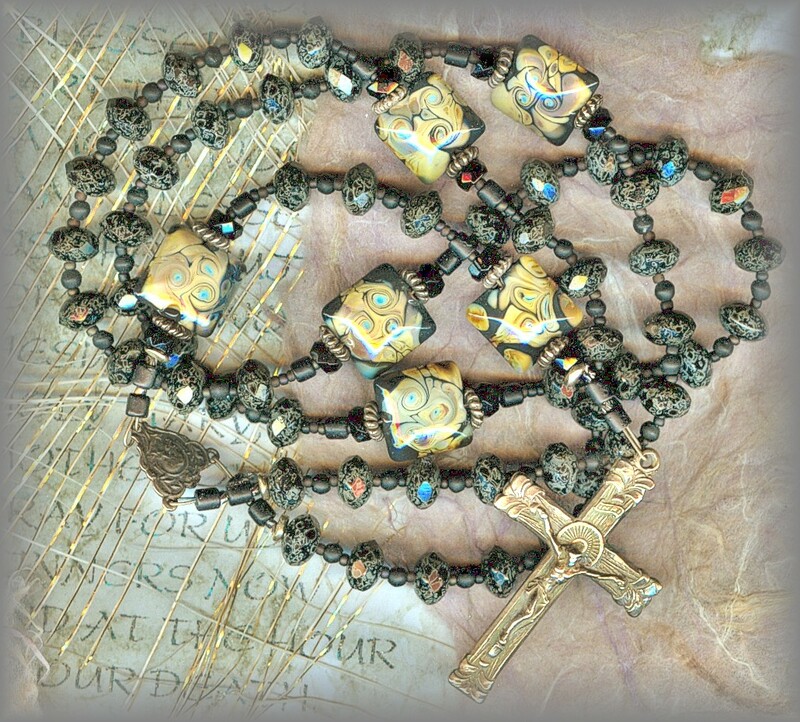 (Light flashing on unseen fragments, hardly seen in the actual bead) PATER BEADS: These beads show swirls of sandy tones along with the rocky shores of the sea of Galilee. Tiny bits of blue here and there suggest the sky above. Each so different, no two alike, unrepeatable like our own unrepeatable uniqueness. 18 As he was walking by the Sea of Galilee, he saw two brothers, Simon who is called Peter, and his brother Andrew, casting a net into the sea; they were fishermen. 19 He said to them, "Come after me, and I will make you fishers of men." This is the sea of a delicacy called 'Peter's Fish', served in the restaurants along the shore with its head on, probably just the way it was served in the time of Christ! ... and there was a calm. 25 Then he asked them, "Where is your faith?" AVE BEADS: The faceted jet glass Ave beads, also called 'picasso' beads are not as defined as the eye of the camera picked up but add more natural depth than if they were solid black, Very, very, subtle. 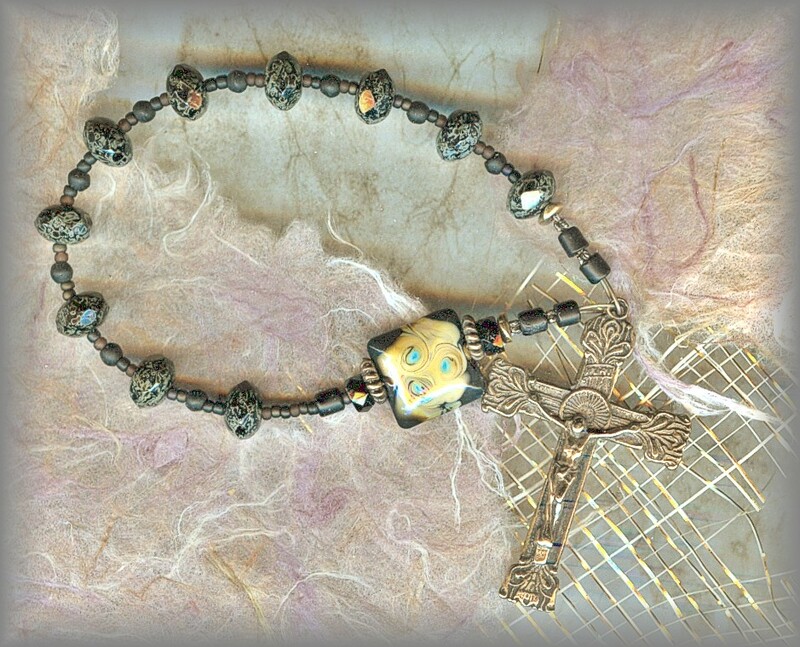 PATER BEADS: This hand made Pater bead is lovely, the earth tone colors are reminders of the shore pounded by the sea, waves and churning foam, sand, rocks and sky above. If you look hard enough you might even see little flowers floating freely on the surface of the swirling waters that were blown in the wind. No two alike. ... A squall blew over the lake, and they were taking in water and were in danger. 24 They came and woke him saying, "Master, master, we are perishing!" He awakened, rebuked the wind and the waves, and they subsided and there was a calm. 25 Then he asked them, "Where is your faith?"